Illustrates the Giza Pyramids and the Great Sphinx. De Stadt Cairus. Le Caire. 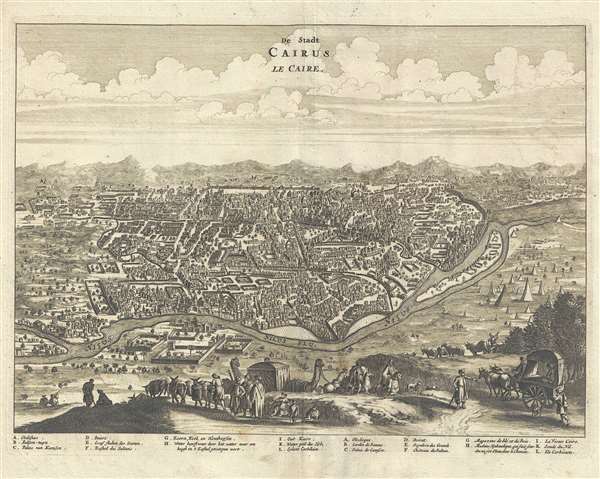 This is a 1686 Olfert Dapper view of Cairo, Egypt. The view depicts Cairo from a hill on the opposite side of the Nile overlooking the city. Cairo stretches out below the viewer nearly to the horizon. Individual buildings are illustrated, and eleven locations are alphabetically identified. A corresponding index, situated along the bottom border below the view, is written in both Dutch and French. In the foreground, traders, craftsmen, and other travelers make their way along the road leading to Cairo, either on their way to the city, or away from it. Horses, oxen, mules, and camels accompany the travelers and are pulling carts, carrying baskets, or supporting riders. The Giza Pyramids and the Sphinx are illustrated on the right, along the Nile. This view was produced by Olfert Dapper and published by in the French edition of Description of Africa entitled Description de L'Afrique and published in 1686. Dapper, O., Description de L'Afrique, Contenant Les Noms, la Situation et les Confins de toutes ses Parties, leurs Rivieres, lerus Villes et leurs Habitations, leurs Plants et leurs Animaux; les Mœurs, les Coûtumes, la Langue, les Richesses, la Religion, et le Gouvernement de ses Peuples. Avec Des Cartes des Etats, des Provinces et des Villes, et des Figures en taille-douce, qui representent les habits et les principales Ceremonies des Habitans, les Plantes et les Animaux les moins connus, (Amsterdam) 1686. Description of Africa (Naukeurige Beschrijvinge der Afrikaensche Gewesten in the original archaic Dutch), first published in 1668, is an enthographic book which describes Africa. Written by the geographer Olmert Dapper and published by Jacob Van Meurs in two Dutch editions in 1668 and 1676, this work is considered to be one of the foundational works of African studies. Over the course of three years, Dapper consults numerous reports concerning the history and geography of the continent (as it was understood by 17th century Europeans) and travelogues. It is said that Dapper relied heavily on the records of the Dutch West India Company, although none of the original reports have been located by historians. In Description of Africa, per the Fondation Dapper, Dapper, 'far from passing judgement on the societies described and by avoiding ethnocentric connotations, was the first to apply an interdisciplinary approach, adroitly combining geography, economics, politics, medicine, and a study of culture.' Dapper did not write a 'work of exotic curiosities, but a work for posterity.' Description of Africa was published in English by John Ogilby in 1670 and a German translation appeared the following year. A French translation of the work was published in 1686. Very good. Even overall toning. Verso repair to margin centerfold separation. Blank on verso.